Dissolved oxygen (hereafter abbreviated as DO) is oxygen (O2) dissolved in water, and in the world of nature, it is dissolved in water in proportion to the partial pressure of O2 in the atmosphere. Dissolved oxygen levels are expressed as the amount of O2 dissolved per unit volume of water (mg/L). It is known that the saturation level of O2dissolved in pure water at 25ºC and 1 atm (1013 hPa) is 8.11 mg/L. Fish and other organisms in water live on DO. The level of DO is affected by the water temperature, salt concentration, atmospheric pressure, and other conditions, and the saturation level decreases with increases in water temperature. In water with high levels of organic pollution and a high BOD or COD*1, a large amount of DO is consumed by aerobic microorganisms as they decompose the organic matter, which causes a reduction in the DO level. Thus, in rivers with high levels of organic pollution, necrosis of aquatic life due to lack of DO tends to occur during hot summers. In the 12-day period between May 28, 2009 and June 9, 2009, a Multiparameter Water Quality Checker (model:U-50) from HORIBA was installed near the surface of Inbanuma (Inba Marsh), a marsh in Chiba Prefecture, to continuously measure DO levels*2. 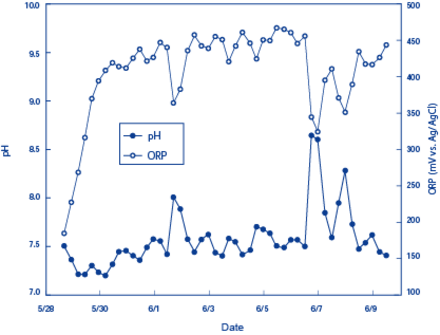 Figure 1 shows the measurement results of DO and turbidity and Figure 2 shows the measurement results of the pH and ORPs. 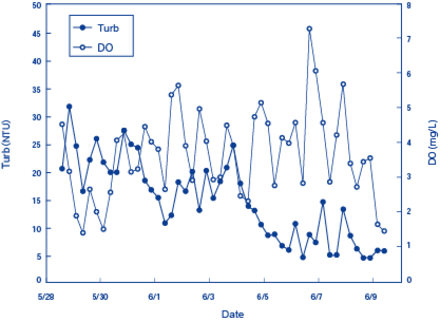 Throughout the measurement period, increases in DO levels were observed in the morning and during the day and decreases in DO levels in the evening and at night. On June 1, 2, 4, and 6, when DO level peaks are observed in Figure 1, there were no clouds or only very thin clouds in the sky. Thus, these observations most likely reflect oxygen production from the photosynthesis (carbon dioxide assimilation) of aquatic plants during the day and their consumption of oxygen (DO) through respiration at night. *1 Biochemical oxygen demand (BOD) and chemical oxygen demand (COD) are indicators of the level of organic pollution in water. BOD indicates the level of pollution as the amount of oxygen required to decompose organic pollutants in water and COD indicates the amount of an oxidant required to do the same. *2 “Development of the U-50 Series Multiparameter Water Quality Checker,” Yuichiro Komatsu, Katsunobu Ehara, and Katsuaki Ogura, HORIBA Technical Report, Readout, No. 35, and 56–61 (2009).